The Roerichs heritage in the Kullu Valley. What are we going to leave to posterity? There has recently been a lot of information in the Russian and Indian media about the positive situation in the Roerichs' estate situated in the Kullu Valley in the Himalayas. 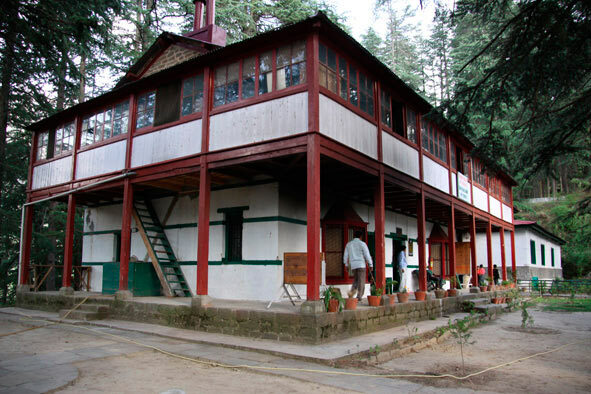 For example, Ambassador Extraordinary and Plenipotentiary of the Russian Federation in India A. M. Kadakin said in his interview to the Nezavisimaya Gazeta that a full-fledged museum complex "was established" and "is working perfectly well" in the Kullu Valley and Urusvati Himalayan Research Institute has already been "restored" . The Roerichs estate is "in a wonderful condition", according to the diplomat. These statements of the high-ranking diplomat need some corrections as they do not reflect the reality of the former Roerichs' estate. In this connection it is appropriate to quote the report made by A. V. Stetsenko, Deputy Director General of the Museum by name of N. K. Roerich, in 2010 at the jubilee conference of the International Center of the Roerichs devoted to the 75th anniversary of the Roerich's Pact, "At the moment the situation with the estate museum of the Roerichs and Urusvati Institute is critical. If we do not take immediate actions to save them, the biggest part of this heritage may be lost". Unfortunately, the situation around the Roerichs' estate is growing worse every year and inertia and indifference of officials may for ever lose Russia, this great power, the invaluable cultural heritage of our great countrymen which they left in the Himalayas to be a bridge between Russia and India. In April 2010 D. Yu. Revyakin and A. P. Prokhorychev, the authors of this article, commissioned by the management of the International Center of the Roerichs, visited the International Roerich Memorial Trust in Naggar (Kullu Valley, Himachal Pradesh, India). The review of the current situation of the Roerichs' memorial heritage in the Kullu Valley given in this article is a result of this visit. 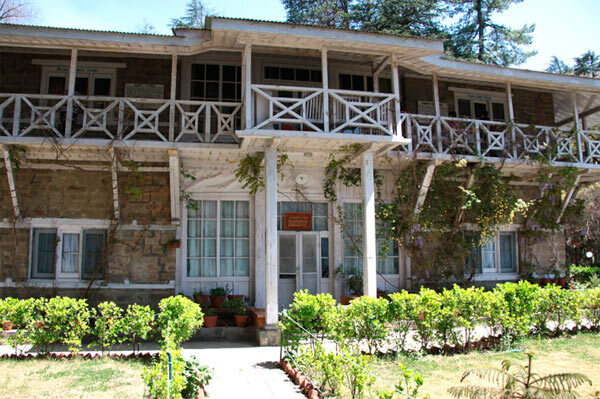 The Roerichs settled in the Kullu Valley in the Hymalayas in January 1929 when they bought Hall Estate from Rajah of Mandi. It included a mansion built by an English landowner Henry Rennick in 1880, outbuildings and a big plot of land with fruit trees. 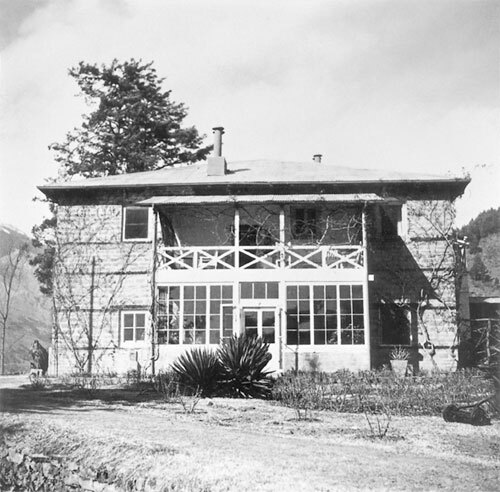 The Hall Estate also hosted Urusvati Himalayan Research Institute established by the Roerichs after their expedition to the Central Asia in 1928. The Institute occupied two buildings beyond the dwelling house up the mountain. The invaluable scientific collections collected by the Roerichs during their expedition to the Central Asia were brought there. 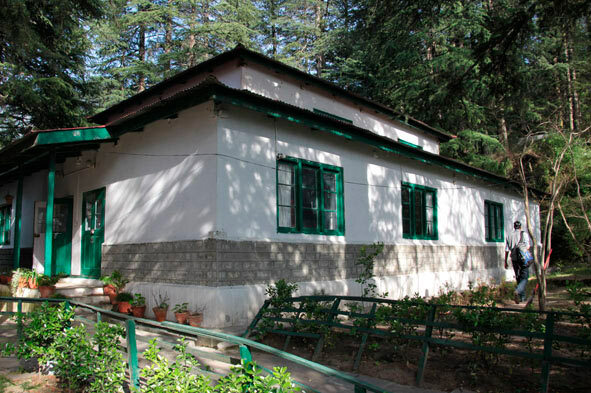 N. K. Roerich gave the biggest part of his estate - 20 acres of land including the mountain slope with a grove of Deodar trees - to the institute for free. In addition to the administrative building which comprised the scientific library, rooms for visiting scientists and the museum with scientific collections, the laboratory building was designed and constructed; it was intended for physical and biochemical research and had all the necessary equipment. Advanced scientific research of the institute made it one of the most prominent research institutions of that time. The institute relied on the methods of new science necessary for future evolution of humankind. These methods were largely based on a new system of cognition - the scientific and philosophic Living Ethics teaching. 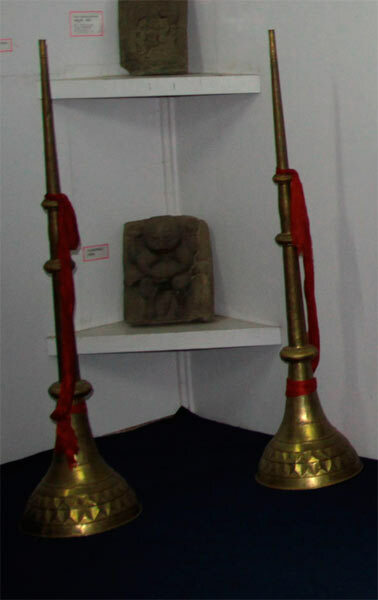 "Viewing knowledge of different branches of science as something synthetic and undivided, the Roerichs reflected this idea in the institute's structure," writes Director General of the Museum by name of N.K.Roerich L. V. Shaposhnikova, "They opened departments of archaeology, natural sciences, medicine, a scientific library, a museum to store the expedition findings. There were units within each department. For example, the archaeological department had a unit of general history, a unit of the cultural history of the peoples of Asia, a unit of the history of ancient art, a unit of linguistics and philology. The department of natural sciences dealt with botany and zoology, meteorological and astronomic observations, studied cosmic rays in high-altitude conditions. The department of medicine, along with the studies of Ancient Tibetan medicine and pharmacopoeia, included a biochemical laboratory where cancer treatment was studied". All members of the Roerichs family were engaged in the work of the new institution. Ye. I. Roerich became the Honourary President-Founder, the leader in many areas of work. N. K. Roerich was the founder and ideologist while Yu. N. Roerich was the director and S. N. Roerich was an active researcher. In addition to stationary studies, the institute, within a short time of its existence, made a number of complex research expeditions to the Kullu Valley, Lahaul, Bihar, Kangra, Ladakh, Zanskar and made a big Manchurian expedition in 1934–1935. These expeditions enriched the institute's museum with new exhibits and collections. At its prime Urusvati had a significant palaeontological, zoological and ornithological (about 400 bird species) collections, a collection of herbarium collected both in the Western Himalayas and during the Manchurian expedition, a collection of medicinal plant seeds, a collection of Tibetan drugs, a rich collection of minerals collected during the expedition to the Central Asia and in the Western Himalayas, a most precious ethnographic collection, a collection of fine and monumental art of the Central Asia region, a collection of numismatics, a collection of archaeology collected during an archaeological dig in the Western Himalayas and Mongolia, the cartographic collection of the Central Asia region, a collection of rare Tibetan manuscripts, a scientific library (more than 4000 copies). The collection samples were numbered and stored on special shelves. Besides, they had Latin names. It is possible that the collections had scientific descriptions. Urusvati had an invaluable scientific archive which included the works of the Roerichs as well as the works of the people who worked with them and the institute's corresponding members; Yu. N. Roerich's diaries, his unpublished scientific works, Yu. N. Roerich's card index on the history of the Central Asia, materials of Tibetan-English dictionary with Sanskrit parallels, a collection of photographs with Yu. N. Roerich's comments, diaries of a medical doctor K. N. Ryabinin and the transportation commander P. K. Portnyagin written during the expedition to the Central Asia. The archive also comprises the institute's correspondence with different research institutions of India, the USA and Europe and with prominent world scientists and individuals. Of special value for the new research institution was a small collection of N. K. Roerich's paintings which consisted of nine paintings; especially notable among them are FiatRex Triptych (1931) devoted to the Roerichs' spiritual mentor, Zoroaster (1931), Holy Trinity (1932), Banner of Peace (1931), Mountain of Spiritual Repose (1931) and other works . Ye. I. Roerich believed that in future the research station (Urusvati Institute - note by the author) founded in the Himalayas must have grown in the City of Knowledge. Successful work of the Institute was interrupted by a betrayal by the Horshes, the Roerichs' closes aides in the US, which in 1935 - 1936 lead to the destruction of Nicholas Roerich Museum in New York. Urusvati's work was finally stopped and the institute was conserved when the Second World War broke out. 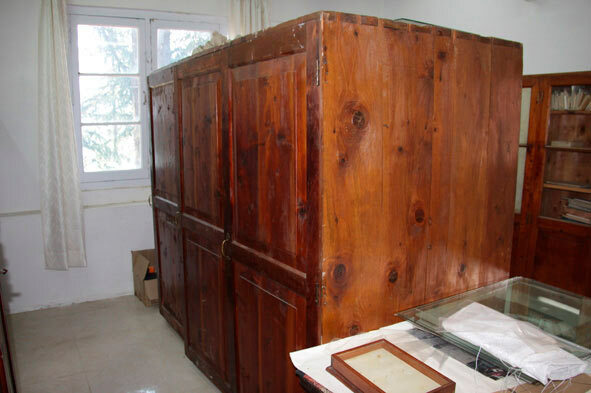 Some of the unique scientific collections were put into wooden boxes, some were locked in special cases in the administrative building while the equipment of the laboratory building was dismounted. The Roerichs continued their intense cultural and research work in the Kullu Valley until 1947 when N. K. Roerich passed away. He bequeathed all his scientific and artistic heritage to his home country. In 1957 his oldest son Yu. N. Roerich brought the first part of the unique heritage to the USSR. He brought N. K. Roerich's paintings, books, scientific and art collections, memorial relics, expedition archives and manuscripts of N. K. Roerich. 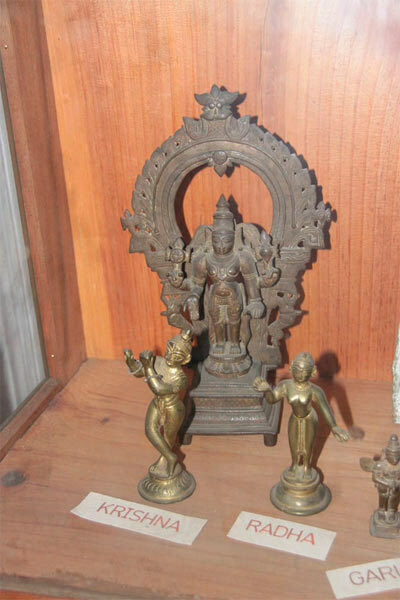 The heritage also included some of the Urusvati collections. 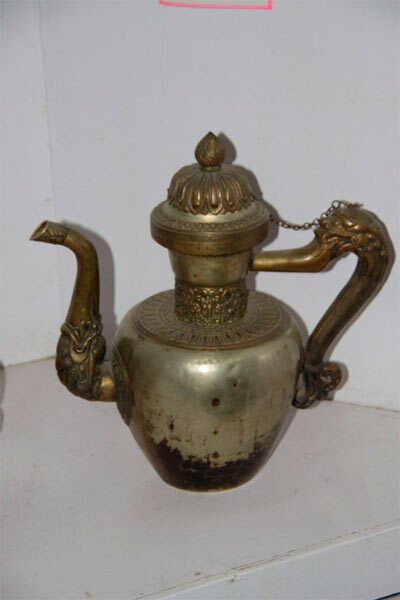 These were first of all the archaeological collection and the precious collection of tankas collected by Yu. N. Roerich between 1924 to 1956. Besides, this part of the heritage comprised the materials of the Urusvati scientific archive: documents of the expeditions to the Central Asia and Manchuria, scientific and archive materials of N. K. Roerich and Yu. N. Roerich, their unpublished works and correspondence. Unfortunately, Yuri Nikolaevich did not have time to manage his scientific and art collections. In future, through fault of the USSR officials, this part of heritage was stolen by V. Vasilchik and I. Bogdanova . In 1990 S. N. Roerich, youngest son of the artist, who founded the International Center-Museum by name of N. K. Roerich in Moscow, gave the Center the second part of the Roerich's heritage through his authorized delegate L. V. Shaposhnikova; the second part included paintings by N. K. Roerich and S. N. Roerich from Bangalore and a big collection of the Roerichs' paintings temporarily stored at the USSR Ministry for Culture, memorial relics, manuscript archive of Ye. I. Roerich and other documents, a collection of books from the Roerichs' library, and many other items. 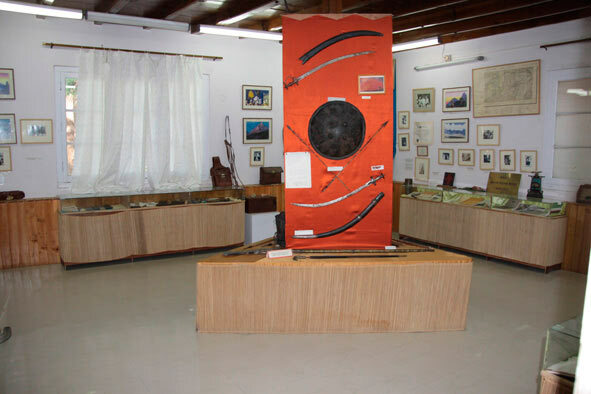 The heritage given to the museum in 1957 and 1990 did not include the scientific collections from Urusvati Institute that in 1990 still remained conserved in the Roerichs' Estate. 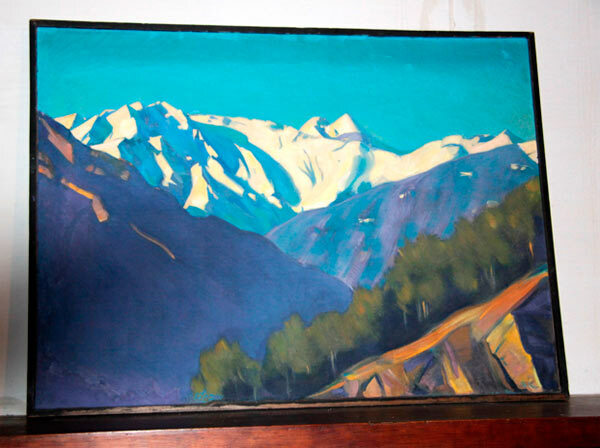 In 1972, invited by S. N. Roerich, L. V. Shaposhnikova visited his estate in the Himalayas. Together with S. N. Roerich she examined the premises of Urusvati Institute. "Light was struggling to make its way though chinks in the tightly closed shutters," Lyudmila Vasiljevna recalls, "When my eyes were used to the darkness, I saw the room was piled high with boxes; there were plenty of them... Along the walls there were glassed cases.. <...> Before me were unique, richest materials no scientist has touched for dozens of years. The glassedcases and boxes contained valuable ethnographic, archaeological and other collections. 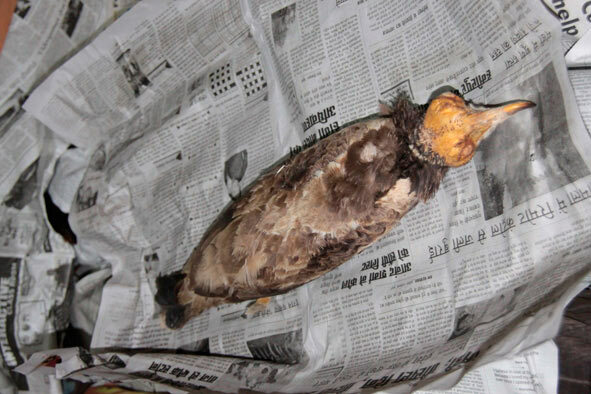 The ornithological collection amounted to about 400 bird species some of which had already become extinct. The botanic collection was a complete representation of the Kullu Valley fauna. The geological one contained quite a few rare minerals. There were also zoological, pharmacological and paleontological collections. We walked into the next room where there were bookshelves along the walls. The library contained more than 4000 volumes with a lot of rare editions among them. 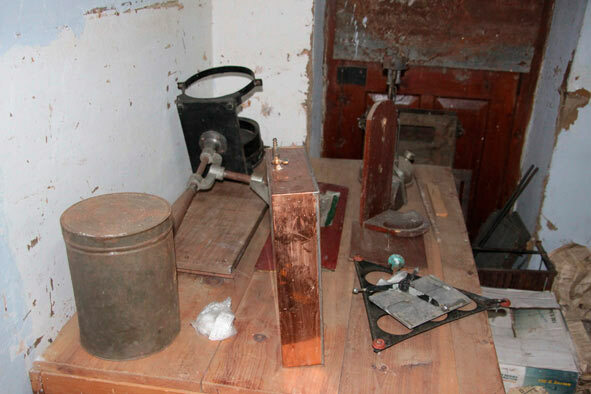 In another building we found equipment of biochemical and physical laboratories". 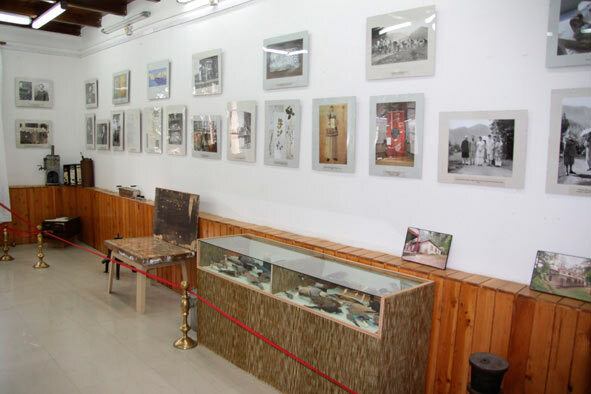 The idea of preserving the Roerichs' estate in the Kullu Valley and turning it into a full-fledged international museum center devoted to N. K. Roerich belonged primarily to Svyatoslav Nikolaevich Roerich. In 1958 he wrote to his elder brother Yu. N. Roerich who was in Moscow, "I am thinking how to arrange the Museum in the Kullu Valley in the best way. After all, this is the place most closely connected with the work of Nik[olay] Konst[antinovich] in India that has extraordinary advantages - climatic, geographic and historical let alone the exceptional beauty of this place. This may become an exceptional center, the way Nik[olay] Konst[antinovich] and Masik thought" . In the letter dated 2 June 1959 one can find concrete practical steps taken by Svyatoslav Nikolaevich to accomplish this goal. "We have decided to decorate three rooms downstairs," he wrote to his brother in Moscow, "in other words the one when Pasik worked, the office next to it and your study. In other words, three rooms in a row. Yet, it will be temporary. I want to have a small building built on the ground where there is the Stone of N. K. <...> It will be much better as it will make things easier. I think I'll turn the small house where the staff lived into the keeper's house. It will be near and convenient. Besides, it'll be separate and there will be no crowds. It'll be possible to have a road for Jeep. <…> We are installing electricity in the house". By June 1959 some progress had been made. Beds around the Stone of N. K. Roerich had been finished and bordered with stones. By the mid-August the decoration of the three rooms downstairs intended for the museum had been completed. S. N. Roerich decided to temporarily hang 30 painting by N. K. Roerich there. 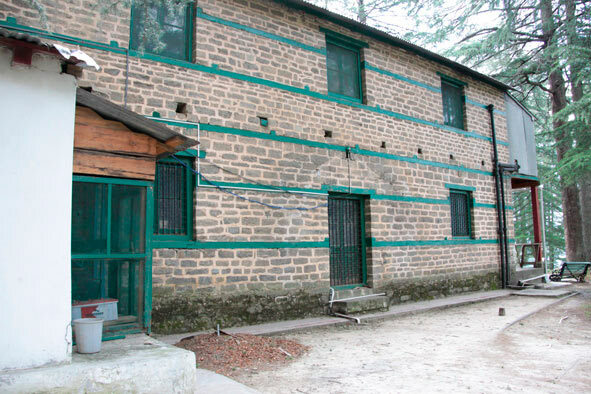 Soon (in the 1960-s) A Note on the Roerich's Memorial Museum in the Hall Estate in Naggar, the Kullu Valley was written by S. N. Roerich. It reveals the scientific conception of the future museum. 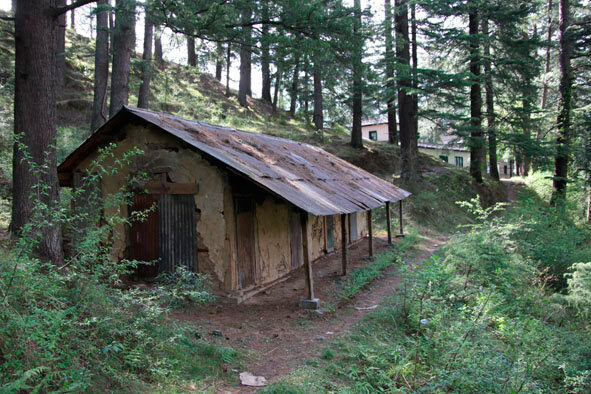 "When it is finished, the museum in the Kullu Valley," the artist wrote, "will have a representative collection of paintings by Professor Nikolay Roerich in a separate building near the main building where Professor Roerich lived and worked. At the moment the main building has three galleries where Professor Roerich's painting are exhibited and that have free access to the public" . And below, "It is difficult to adapt an old building for the use as an art museum, however it can present additional interest on its own". From the above quotations of S. N. Roerich's writing it is obvious that the artist was thinking of a new museum building for the collection of paintings while he was going to make the house a part of the future museum complex as a separate memorial museum object. Svyatoslav Nikolaevich wrote in the note that the future museum, along with the works of N. K. Roerich, will also have his own paintings as well as "some samples of old Himalayan schools of painting that flourished in the Kully Valley and the neighbouring valleys in the XVII-XVIII centuries" and the library that belonged to the older generation of the Roerichs. In 1965 S. N. Roerich wrote to P. F. Belikov concerning the organization of the museum in Naggar, "This year there are another 25 paintings by Nikolay Konstantinovich. Personally I think we should not exhibit more than 50 paintings here at the moment. We are formalizing the construction of a separate building. It is not easy because the construction materials have to be brought by people. There is no big road here yet. It all takes a lot of time [...] the work is being carried out to get ready the construction materials while flagstones are being arranged around the monument to Nikolay Konstantinovich and the paths that lead to it. It will look nice. There are a lot of visitors" . It seems that the place S. N. Roerich finally chose for the museum was somewhat uphill to the Roerichs' house. In this connection it is necessary to quote V. M. Sidorov who visited the Kullu Valley in 1974. After S. N. Roerich showed his guest Urusvati Institute, he took him to a two-storey building that was being constructed on the artist's money. "There will be a new museum here", said Svyatoslav Nikolaevich, "It is going to be a kind of an island of the Russian culture in the Himalayas as there will be the paintings by my father and me. There will also be works of folk art of the Kullu Valley peoples" . Unfortunately, S. N. Roerich's plans to construct a new building to open the museum were not implemented. One of the possible reasons was the reorganization of the state of Punjab. The Kullu Valley where the Roerichs' estate was situated became part of a new state of Himachal Pradesh. S. N. Roerich noted that in this way the Kullu Valley would benefit from the program of the hill country development . At the same time he believed, however, that the division of Punjab "would make things too complicated" . Another possible reason why the construction was not completed might be the problems of expensive construction materials, in particular cement, that were difficult to find, buy and deliver and workforce that was, according to S. N. Roerich, "almost impossible to find because of various government projects" . Finally, the third possible reason might be the difficulties connected with funding the construction works that were carried out solely on Svyatoslav Nikolaevich's expense. The memorial constructions of the Roerichs' estate and scientific buildings of Urusvati Institute were gradually decaying. 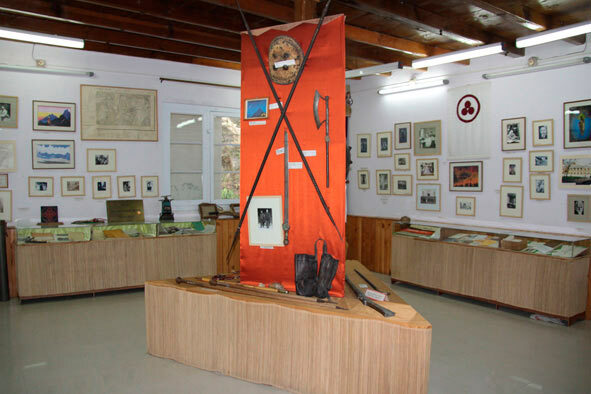 More and more efforts were needed to preserve and continue the development of the memorial complex including Urusvati Institute and its valuable collections. In the 1970-1980s Svyatoslav Nikolaevich Roerich repeatedly appealed to Soviet and Bulgarian research authorities suggesting they lead the work on the revival of Urusvati Institute. These negotiations did not bring any tangible results as they had not been supported by the party organs supervising the work of research institutions in the USSR and socialist Bulgaria. Who prevented the International Roerich Memorial Trust from becoming the International Research and Cultural Center? S. N. Roerich got back to the idea of a new international research and cultural center in Naggar in the early 1990s when he came up with the idea of the International Roerich Memorial Trust in India. 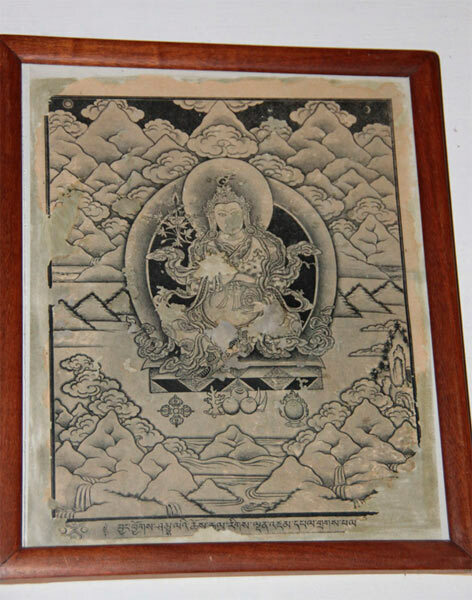 To achieve this goal, Svyatoslav Nikolaevich granted A. M. Kadakin general authority to manage the artist's movable and immovable property in the Himalayas . 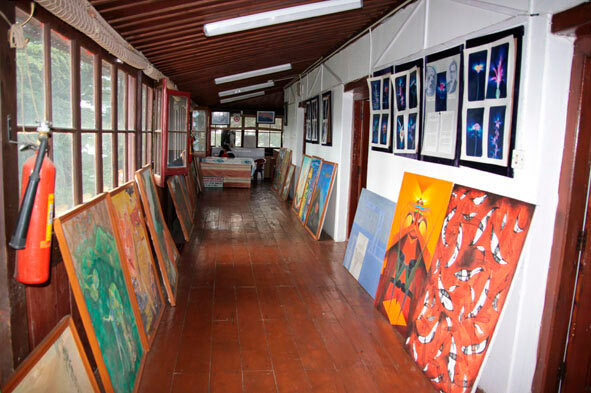 The IRMT was the second international NGO after the Center-Museum by name of N.K.Roerich established by S. N. Roerich to preserve the creative heritage of the Roerichs and make it accessible to the public. On S.N. Roerich's initiative the Center became one of the founders of the IRMT . In his letter to the President of Russian Federation Boris N. Eltsin he wrote – “I am sure that the activity of the Center, which is one of the founders of the International Roerich Memorial Trust, would benefit the cultures of Russia and India”. He tied the future of the Roerichs' estate in the Kullu Valley and Urusvati Institute first of all with the Center-Museum opened in Russia. 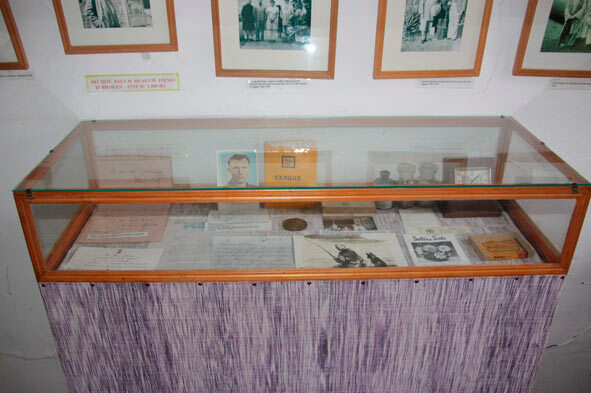 A few years earlier in his letter that became known under the title "We can not be marking time" Svyatoslav Nikolaevich wrote, "As I see it, Urusvati Institute where as you know the unique collections are safely stored may in future become the Indian branch of the Center-Museum as joint Soviet-Indian institution" . ТThe opening ceremony of the Trust was held on 15 June 1992 in the conference hall of the Ashok Hotel in Bangalore. The ceremony was attended by S. N. Roerich, his wife Devika Rani Roerich, prominent workers of Indian culture, diplomats and guests from Russia, the USA and Australia. S. N. Roerich was elected President of the IRMT. Russia's President B. N. Yeltsin, Ambassador of Russia in India A. M. Dryukov, Vice President of the International Center of the Roerichs L. V. Shaposhnikova, Consul Ambassador A. M. Kadakin and other prominent members of Russian and Indian cultural public became honourary members of the Trust on the Russian side . 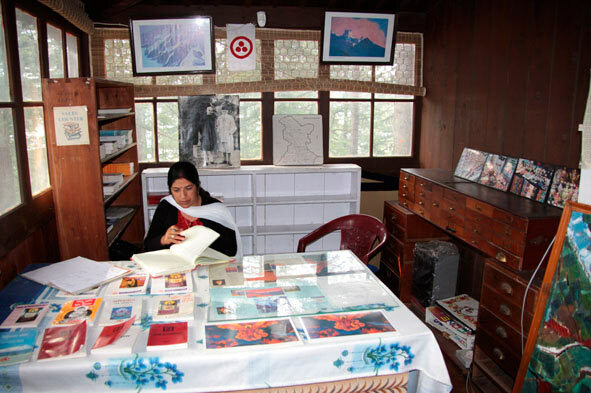 "The International Roerich Memorial Trust was founded in Bungalore under my leadership; the main objective of the Trust is to preserve the property of my family - the books written by my Mother, works of my brother Yuri in different languages, works of Devika and, of course, paintings by my Father and me that are now in Bangalore and the Kullu Valley - that will contribute to the future spiritual and cultural relations with many peoples" . It is perfectly clear from the above quotation that S. N. Roerich founded the Trust to preserve the Roerichs' heritage stored both at Tataguni and the Kullu Valley with the Roerichs' estate in the Kullu Valley being the northern branch of the IRMT. A. M. Kadakin became the chair of the IRMT northern branch. 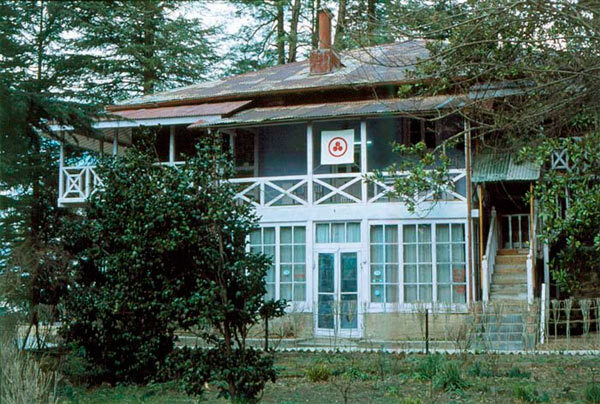 In his letter to L. V. Shaposhnikova he wrote, "For dozens of years nothing has been done concerning the revival of Urusvati Himalayan Research Institute, Naggar, Himachal Pradesh, founded by the Roerichs (N. K. Roerich, Ye. I.Roerich, Yu. N. Roerich and S. N. Roerich). The Hall Estate buildings and facilities are decaying, including the memorial museum and gallery of N. K. Roerich; gardens are neglected; the estate is almost not guarded. <...> I do not think there is a need to persuade anyone that preservation and revival of this plot of Indian land connected with the memory of a Russian family that made a unique contribution to the spiritual and cultural life of our civilization and pioneered Russian-Indian relations is a matter of great urgency" . 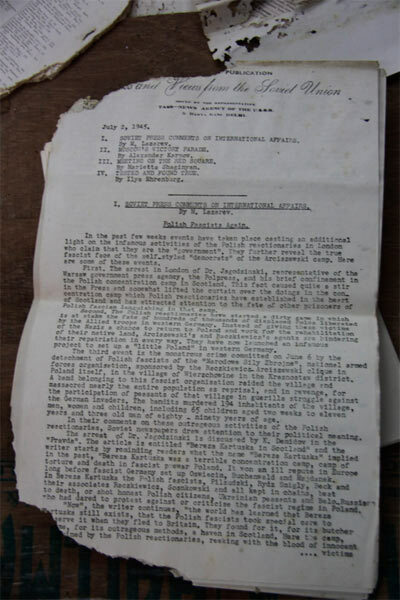 The letter also said that the work on the revival of the Roerichs' estate in the Kullu Valley would be carried out "with the blessing of India's officials in conformity with Indian legislation and with participation of Indian cultural, educational, public, scientific and charity organizations..." . – The IRMT will be committed to funding restoration of the buildings, maintenance of the complex's territory and taking other necessary organizational and administrative measures". It looks that the registration of a new Trust in Himachal Pradesh met certain selfish plans of Mary Punacha. 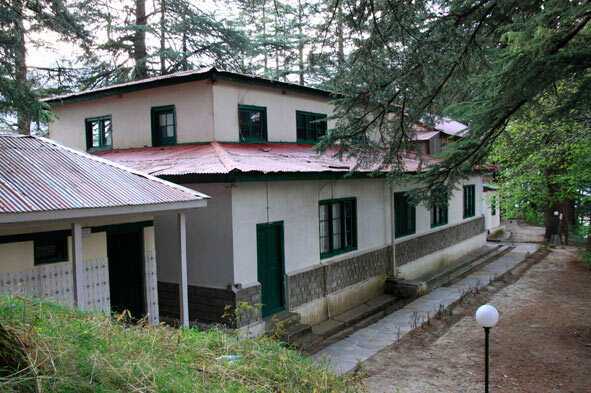 The former secretary of S. N. Roerich tried to get control not only over Tatugani but also over the Roerichs' estate in the Kullu Valley with all ensuing consequences. 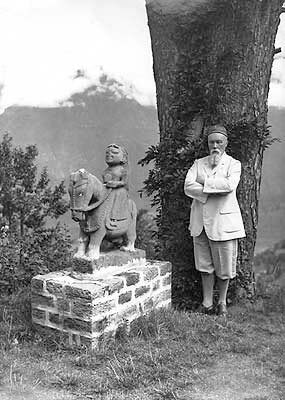 Thus the will of S. N. Roerich to establish a single institution to preserve and develop the Roerichs' memorial places in Tataguni and the Kullu Valley he had repeatedly expressed in his letters about the Trust foundation was grossly violated. One of the results of the fraud committed by M. Punacha and her accomplices was that the Trust became subject to the local authorities of Himachal Pradesh but not the federal government which lowered the Trust's status. Local official lobbying their own interests became the main actors in the Trust. Despite the foundation of the IRMT, the situation in the Roerichs' estate left much to be desired. In the early 1990-s Ursula Ayhshtadt replaced the Roerichs' former servants Vishna and Mynah who had served them truly for many years. Unfortunately, she was unable to preserve the memorial complex and the Urusvati Institute collections alone. The complex was still not guarded. 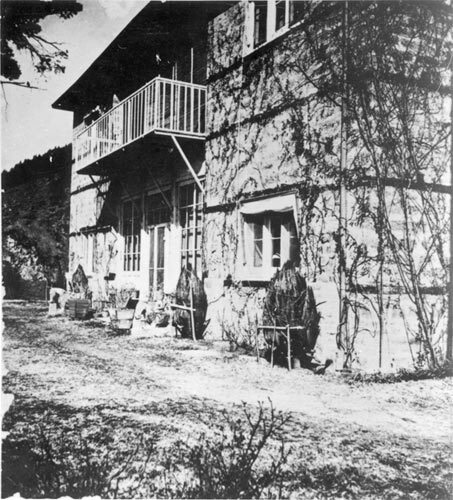 While Ursula lived in the Roerichs' house where she occupied the room of N. K. Roerich's former secretary V. A. Shibaev and looked after it, Urusvati Institute was considerable distance from the house and was extremely vulnerable to attacks of local young hooligans who wrote on plastered wall of the former institute buildings and attacks of regular robbers. Yet, there were other problems worth mentioning that were by no means less serious. In 1992 officials of the Russian Embassy in India A. M. Kadakin and B. S. Starostin who ran the Russian cultural center in New Delhi arranged a trip to work in Urusvati. The peculiarities of this "work" became known to the public later, when Amrita Ural Publishing House published, without any appropriate scientific comments, the expedition diary of K. N. Ryabinin written by him during the expedition to the Central Asia. The circumstances of this finding are extremely curious. 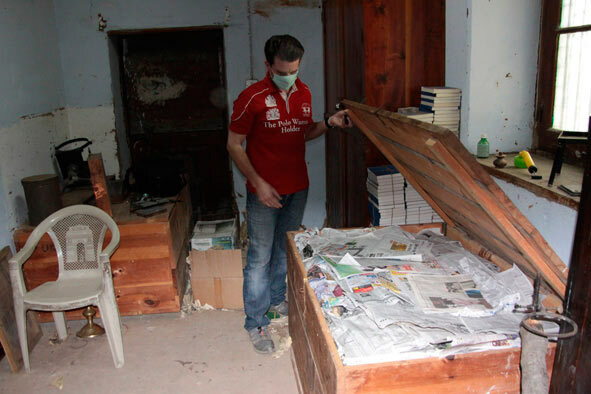 "Cleaning up a building of Urusvati Institute" Starostin's ten year-old daughter "dug out a pile of old mouldy notebooks neatly tied with a string <...> from under decaying journals in one of the boxes" . This is how the full text of original diaries of doctor K. N. Ryabinin was found. 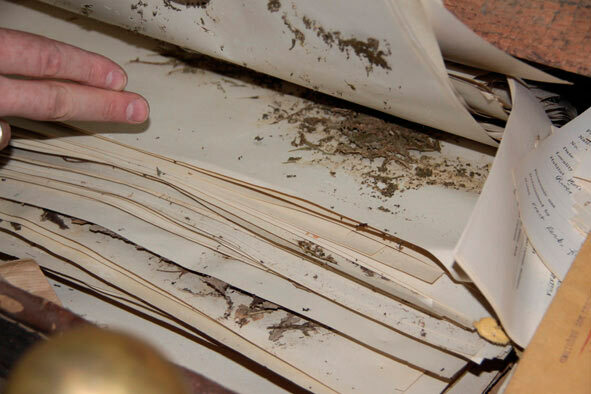 The peculiarities of this "cleanup" in Urusvati would be revealed later when Starostin appropriated part of these notebooks which in the future would disappear without trace. 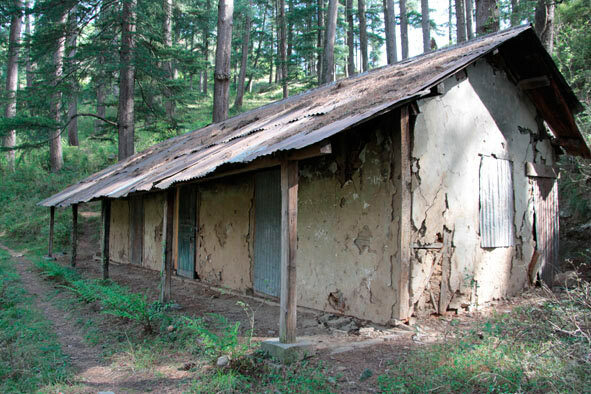 In this connection the publication called The Roerich's Lindens in the Kullu Valley attracts particular notice; the anonymous author describes their work with scientific heritage of Urusvati Institute, "Finally the day came when we set to partial restoration of the complex. Simultaneously, we examined some of the packed boxes with books and manuscripts which, however, had not been taken away. The boxes turned out to be very heavy - there were four of us but we could lift none of them and were only able to push them to the door. When we were outside, we opened the lid. Step by step we came to see the unique library of Yuri Nikolaevich Roerich. We were amazed at his wide interests. In his library there were books in all major European languages as well as Tibetan and Hindi related to almost all branches of knowledge. There were comparatively few works of fiction but the boxes contained only a part of the Roerichs' library that were not taken away and remained there by pure chance. In addition to the books we found diaries of the Roerichs' fellow travellers, in particular, doctors Ryabinin and Portnyagin. It was written by Portnyagin on an ordinary notebook with notes made in pencil that the diary had been kept upon the request of Yu. Roerich and he would have all the right for using the materials after they were edited and that the author had received 195 dollars for it". Surprisingly, but what was considered by S. N. Roerich as "unique collections" "kept in order" in the late 1980s was easily turned by these "researchers" into something that was not taken away and remained there by pure chance in the 1990s! Besides, the described discovery of Ryabinin's diaries proves that the work was carried out by B. S. Starostin's group. Apart Starostin S. Senkevich, N. M. Sazanova and others "worked" in the Roerichs' estate in the early 1990s. "Senkevich and I worked well in the house. 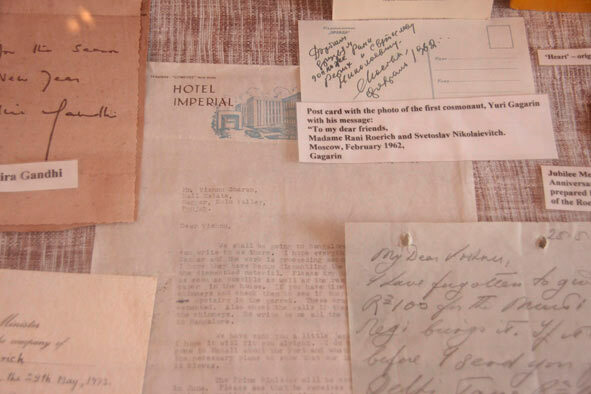 I looked through the manuscripts and old journals," Sazonova wrote in her diary in connection with her stay in the Roerichs' estate in 1993 . The place was also visited by V. A. Rosov and R. B. Rybakov. The results of "the work" exceeded all expectations. According to L. V. Shaposhnikova, R. B. Rybakov was not ashamed of boasting of the valuable thing he had acquired in the Roerichs' estate, namely the diary of Yu. K. Roerich with expedition maps. It is unlikely it will ever be possible to find out how many archive materials of the Roerichs these people carried with them from the Kullu Valley. The above clearly characterizes the true "scientific" level and moral qualities of our countrymen who by a twist of fate happened to be by the unique scientific heritage of the Urusvati Institute. The Institute's heritage that "was not taken away and remained there by pure chance" was a plum for all those who had no relation to it. In this connection it is necessary to mention another sad page in the history of the Roerichs' estate and Urusvati Institute connected with unauthorized activities of M. Lunev and the so called Eastern Roerich Society of Urusvati. In the early 1990s, under the pretence of restoring Urusvati, Lunev began a fundraising campaign among the Roerich societies in Russia and the CIS and tried to carry out unauthorized repairs in the Roerichs' estate. 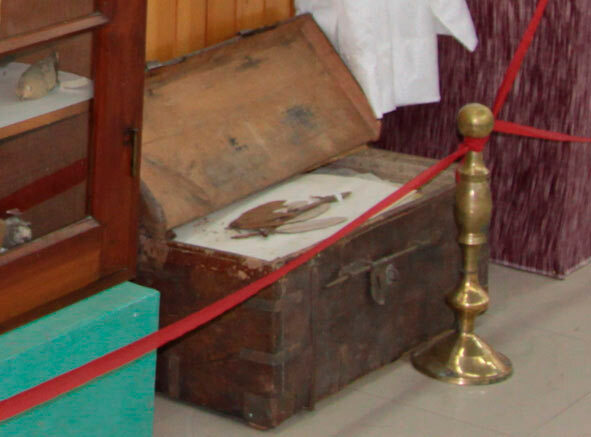 As a result of his ignorant activity, not only false information on the Roerichs' work in the Kullu Valley was disseminated but also some of the authentic items of the Roerichs' heritage disappeared, in particular books, personal belongings, exhibits from Urusvati Institute and pieces of furniture from the mansion. 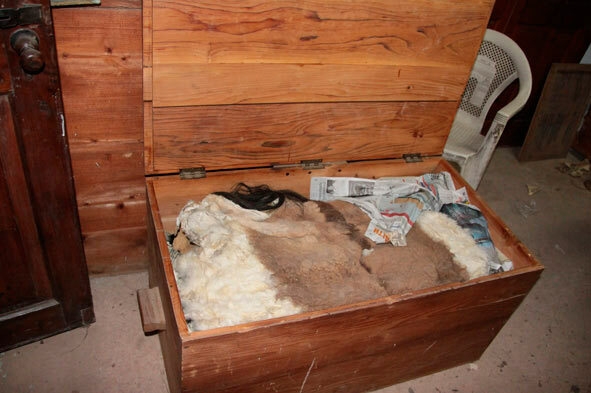 According to L. V. Shaposhnikova, it is known that Lunev's people stole and carried somewhere the bed of Ye. I. Roerich from the Roerichs' bedroom. In the early 2000s one of the authors of this article had a chance to hold scientific brochures in English from the Urusvati library that were taken by one of M. Lunev's former employees who lived in Rostov-on-Don at that moment. M. Lunev's activity in the Roerichs' estate was stopped only in 2000 after President of the International Center of the Roerichs' Yu. M. Vorontsov interfered supported by the Ambassador of the Russian Federation in India A. M. Kadakin. At a regular meeting the Board of Trustees of the IRMT made a decision "not to let ignorant individuals like Lunev into the Roerichs' estate", individuals who did not have any relation to the problems of Urusvati Institute . At the same meeting, upon the request of trustees from Russia, the board introduced a new position of the managing director-curator to represent the International Center of the Roerichs. A. Adamkova was appointed to occupy this position. In this connection one can not but mention another tragic event which occurred in 1996. While Lunev was misleading the Roerich community and raising money for the so called revival of Urusvati Institute, the Indian side carried out a range of construction works in the Roerichs' estate without reaching an agreement with Russian representatives of the International Center of the Roerichs. As a result of the introduced architectural innovations and changes, the Roerichs' estate was in emergency condition and the memorial territory around the estate was badly distorted. A connecting gallery was constructed around the upper floor of the Roerichs' house. The Indians also began the construction of a modern hotel with a restaurant in close proximity with the memorial house. 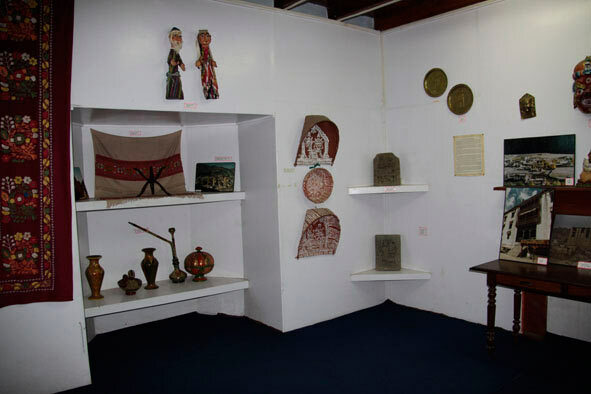 The same year the so called Museum of Folk Art of the Himalayas opened in the administrative building of Urusvati Institute; the conception of this exhibition had nothing in common with the activities of the Roerichs. These innovations were initiated by Kamal Anand who was at the moment the secretary general of the IRMT. The project included the construction of a connecting gallery on the upper floor of the house. It was supposed that a staircase would lead to the gallery from the ground floor of the southern facade. This project badly distorted the historic appearance of the house, that is why the Director General of the Centre-Museum by name of N.K. Roerich L. V. Shaposhnikova as member of the Board of Trustees of the IRMT informed Kamal Anand of the impossibility of this project. Despite the disagreement of the Russian representatives of the IRMT, Kamal Anand permitted the implementation of this wrong project contradicting to the international museum ethics. Serious architectural and engineering mistakes made during the gallery construction led to the distortion of the historic appearance of the building, emergence of numerous splits in the supporting walls threatening not only the new gallery but also the memorial building with a collapse. Roerichs' house. The southern façade view, the 1930-s Roerichs' house. The contemporary view of the southern facade. The southern façade of the house, where the main entrance was located during the Roerichs stay here. It is distorted by a wooden staircase rising to the gallery of the second floor, and the hanging gallery remake. Roerichs’ house. The western façade view. The 1930s. Roerichs’ house. The contemporary view of the western façade. The western façade is distorted by the overhanging gallery, and the balcony view does not correspond to the historical appearance in the photo of the 1930s. (the historic balcony was destroyed during construction works in 1996). The balcony remake, which is a continuation of the transition gallery, is supported by wooden poles, also remakes. The West Entrance at the Roerichs time was decorated with two ancient equestrian statues of the rulers of the valley. 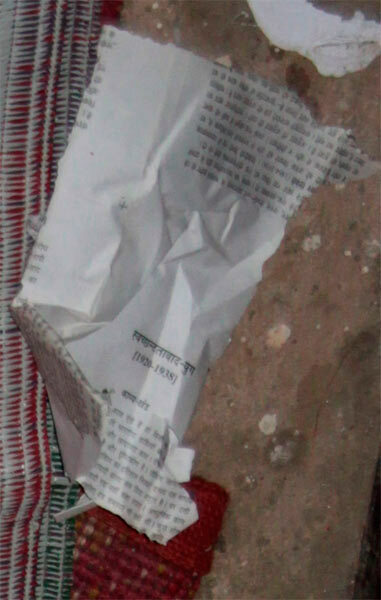 They are now removed and included in the sculptural group sanctuary erected at the statue of Guga Chohan. Under the windows located to the right and left of the entrance, the Roerichs installed stone steles with statues of ancient deities. Now they are also removed in a modern sanctuary, created at Guga Chohan. The sanctuary is another innovation of 1996, which has no relation to the Roerichs. The northern façade is distorted by the construction of a garage remake for N.K. Roerich’s car and transition gallery at the second floor level. 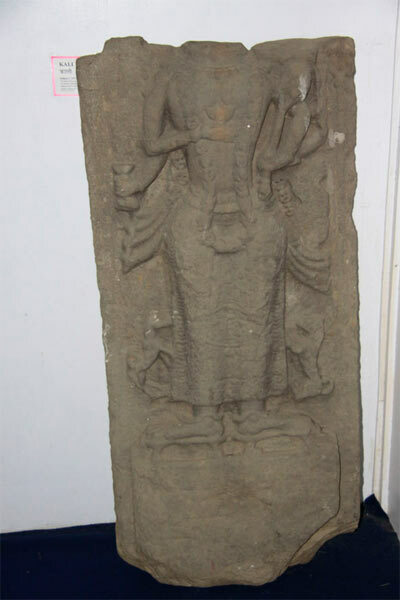 Ancient stone statues set by the Roerichs along the wall on stone pedestals were removed during the construction of the garage and partially transferred to the so-called sanctuary formed around the sculpture of Guga Chohan. Roerichs’ house. The northern façade view. The 1930s. The contemporary view of the garage attached to the northern façade. 2010. It is also worth noting that all construction works in the house were carried out without any protective measures with regard to the Roerich heritage inside the house. Considering the problem of distortion of the historical appearance of the Roerich estate, it is impossible to not notice the changes in the area adjacent to the house. 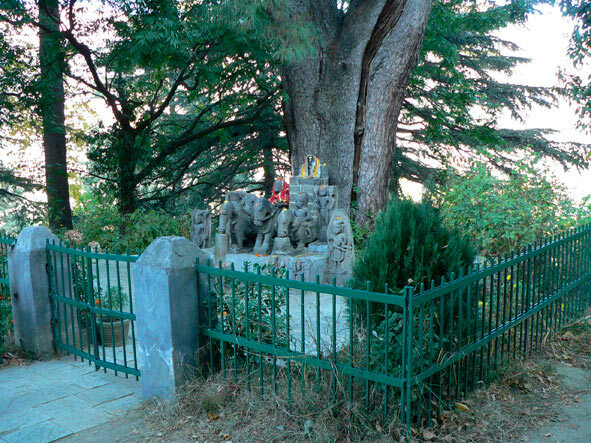 In 1930, the Roerichs not far from the house discovered a stone equestrian statue put on a low stone pedestal at the cedrus deodara located at a site adjacent to the north-western part of the house. 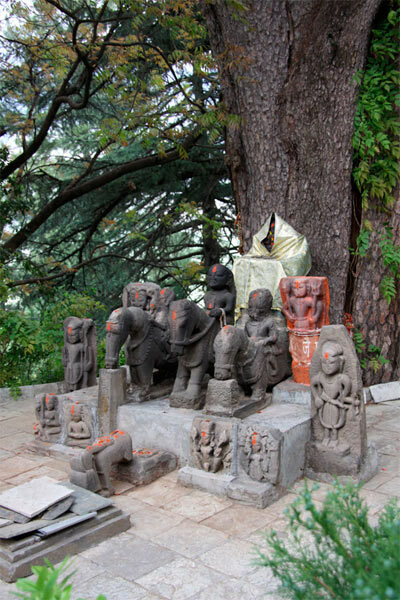 The statue, in which local residents recognized Guga Chohan, the ancient ruler of the valley, subsequently became an object of worship and pilgrimage for many Indians. The statue stood on this pedestal until the 1990s. S.N.Roerich did not think it necessary to make any changes since the historic landscape of the entire area in front of the house, repeatedly captured by N.K. Roerich on his canvases, had been lost. Construction works in 1996 have distorted not only the appearance of the house itself, but also the historical appearance of the area adjacent to it. 12 stone statues were put around the statue of Guga Chohan. In addition, a new pedestal for them was created instead of the old one, which was destroyed. Also, a hearth-sanctuary for performing puja was made near the sculpture group. Metal fence was put around this entire complex. Trails near the house were asphalted, and bushes were plant along them, which had never been there before. According to the implemented project, the ancient monument was forced to meet immediate needs of the local Indian management of the Trust, which were aimed solely at attracting tourists to the Roerich estate. 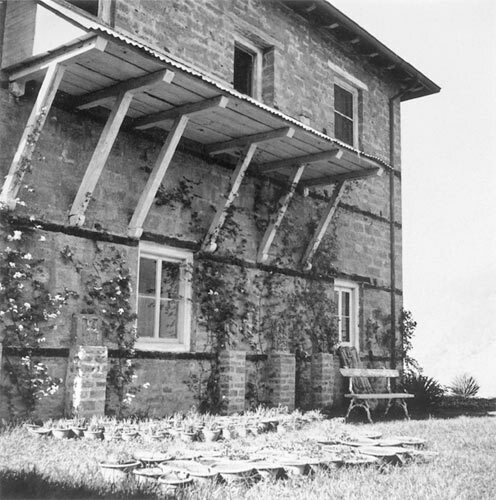 In this connection, it seems appropriate to offer evidence of the journalist S. Carmalito who saw Roerichs’ house before and after the architectural alterations in 1992 and 2000. He wrote: “At the edge of the terrace facing the valley, national flags of Russia and India were flying on two flagpoles. “Perhaps politically it's right, but why here and not at the gates, outside the memorial area?” I thought. The look of the house was even more puzzling. On the perimeter of the second floor it was embraced by an open gallery under the peak, as if continuing the roof. Painted white, the remake at first glance looked organically, echoing the traditional architectural forms here. But that was not Roerichs’ house. Another extension to the house was discovered around the corner – a garage, more like a glass porch. It had a dark green Dodge of 1928 owned by the Roerichs. <...> It is sad that only because of it was the reason to break one of the main principles of any museum: to preserve the monuments intact. Yet the most disappointing thing for me was not even the construction activity, which dramatically distorted the look of the house, but the changes that affected what was its spiritual component. Under a huge cedar, where stood a solitary stone statue of Hugo Chauhan on a bogatyr horseback, Rajput conqueror of the valley, deified by its inhabitants, many statues crowded. Found once by the Roerichs in abandoned temples of the Kullu valley or brought from faraway places, they had towered like guards by the walls of the house. Two other statues of Hugo Chauhan, which once guarded the entrance to the artist's studio, also did not mix with “the crowd”. 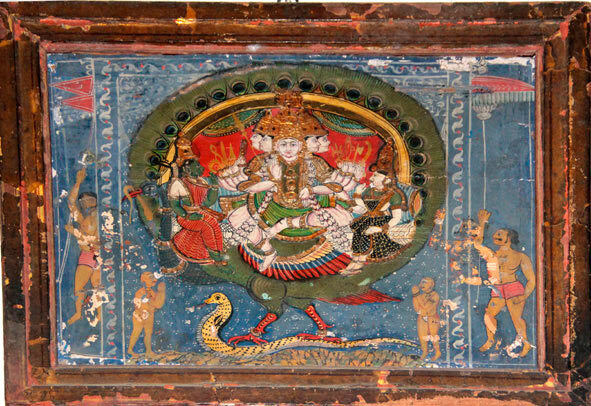 <...> Now Hindu gods and epic heroes were in the same company, and obviously artificial”. The same publication contains an interview with the guardian of the estate, Ursula Eichstadt, who told the journalist about the impact of the architectural invasion into the house that resulted in holes in the roof, through which the rainwater rushed into the house. Thus, the implementation of the project in 1996 has demonstrated that local state authorities allowed strangers to manage the fate of the Roerich estate, who do not understand its true cultural value, its special status of a memorial and not able to establish an international research and cultural center, as S.N. Roerich wanted. What Will We Leave to Future Generations? In April 2010, we had a chance to explore much of the Roerich heritage located in the International Roerich Memorial Trust. What we saw both delighted and saddened. On the one hand, we saw a rich memorial collection of enormous scientific and artistic value. It includes dozens of paintings by the Roerichs, their personal belongings and priceless samples of Oriental art, books, documents, photographs, letters and other rarities. On the other hand, we were deeply saddened by the state of preservation of many exhibits, as well as their storage and display. Let us discuss this more in detail. Roerichs’ house. Currently, interiors of Roerichs’ house are closed to the public. By the stairs on the south side of the house, visitors in small groups go to the transitional gallery encircling the entire top perimeter of the house at the second floor level. Through the second-floor windows in dim electric light, they can partly see settings in several rooms of the Roerichs: bedroom of the junior Roerichs bedroom of the senior Roerichs, study of E.I. Roerich, drawing room, room of D. Rani Roerich. It is almost impossible to closely see most of the objects as they are at a considerable distance from the windows or out of view. The window glass is dirty with numerous touches of visitors and gives a strong glare when in the sun. To see something close, the viewer have to press their face to the glass. The concept of exposure is also unclear, since it is obvious that the furniture arrangement differs significantly from that in the time when the Roerichs lived there. The principle of selection of exhibits placed in rooms of the second floor is also unclear. The House currently contains a significant amount of the Roerich heritage in need of close attention from museum specialists (both Russian and Indian), which the Trust lacks. These are paintings by N.K. Roerich, S.N. 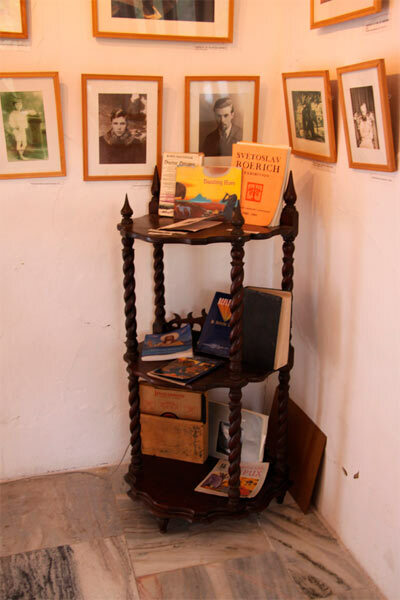 Roerich, personal belongings of the Roerichs memorial furniture, a large number of memorial books and magazines, household items, valuable works of oriental art. Let us here dwell on 2 paintings by S.N. 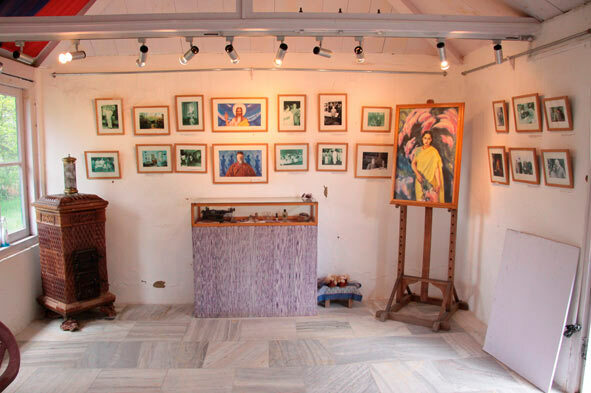 Roerich exhibited on the second floor of Roerichs’ house. These paintings do not have frames. The work under the title "Gepang" is in extremely poor condition. At the top of the canvas, in the sky, there is a strong multiple craquelure with traces of late non-professional restoration. There is also some falling out of the paint layer. The bottom has a trace of a large flow. 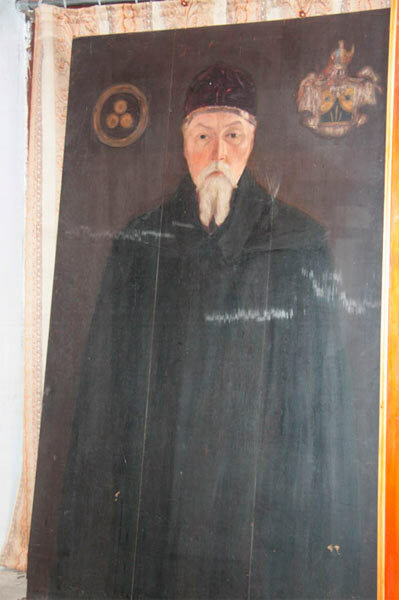 Icons of the Roerich family needs immediate restoration, just as the Tibetan xylographer and a painting by the local art school, which are on the second floor of the house. The same applies to a significant number of memorial books. Art Gallery. Of the examined paintings exhibited in “Art Gallery” located in three rooms of the first floor of Roerichs’ house, the condition of the portrait of N.K. Roerich painted by S.N. Roerich, oil on board (122.5x78cm), raises serious concerns. 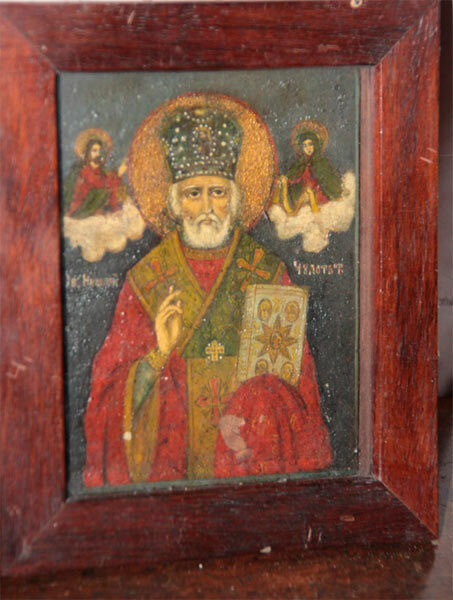 The painting is unframed in a niche closed with glass. Before the construction of the contemporary garage where the repaired car of N.K. Roerich is, this niche used to be a window opening of the study of N.K. Roerich. The paint layer of the painting is very dirty with dust. The board consisting of three parts cracked in the joints, resulting in two vertical cracks on the face side that appeared here over time. There are multiple scratches, abrasions and grazes of the paint layer. The paintings by N.K. Roerich, the “Himalaya” series lack safety strips between the paint layer and the glass, which is a violation of the conditions of storage and display of tempera painting. Several paintings by S.N. 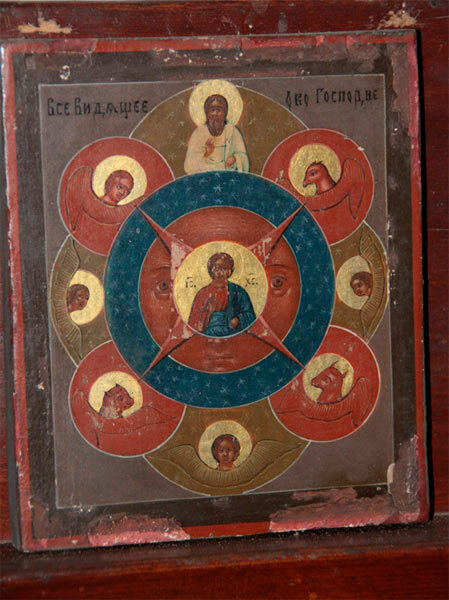 Roerich are exhibited without protection screens, which is also not conducive to their preservation. Summer Studio of S.N. Roerich. A little below Roerichs’ house is the former summer studio of S.N. Roerich. It was opened for visitors in 2004 in the former studio of S.N. Roerich, which also exhibits memorial relics belonging to S.N. Roerich and D. Rani Roerich, temperature and humidity regime has long been not observed. Some of the exhibits are severely damaged and in need of restoration. These include the watercolor drawing by S.N. Roerich “Fishing” eaten by silverfish and cold-proof slippers of D. Rani Roerich, with severely damaged fir. The watercolor drawing by S.N. Roerich is in urgent need of removal from the exhibition and restoration. Original handwritten documents of the Roerichs, which is expedient to replace by copies, are kept in display cases in unsuitable conditions. Display cases themselves are outdated and need to be replaced by ones that are more modern. A porcelain set is placed on the table without any protection. Thus, visitors can touch unprotected pieces of the set, or take them in their hands or brush against them accidentally. The same is true for the memorial books and records, which are displayed openly and absolutely unprotected. The superintendent, who is supposed to be inside the building, is often absent. Summer Studio of S.N. Roerich. General view Summer Studio of S.N. Roerich. General view of the right part of the display. Display of the Summer Studio of S.N. Roerich. General view of one of display cases. 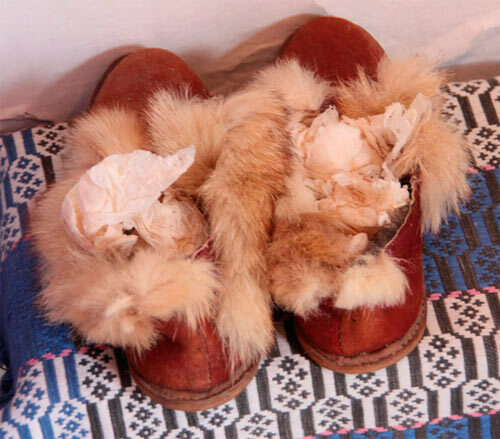 Leather slippers with fur (D.Rani Roerich-? 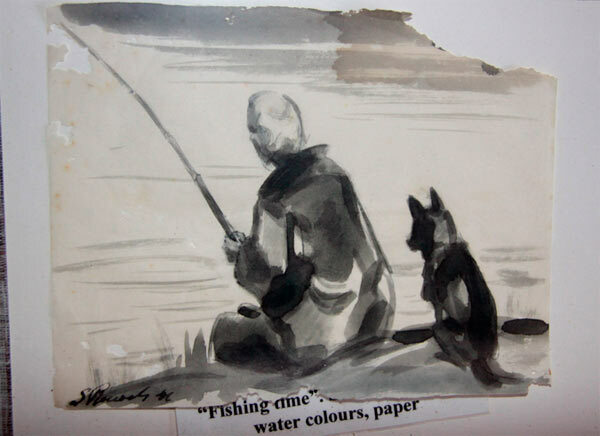 ), watercolor by S.N. Roerich. Urusvati Institute It is necessary to highlight the state of the former Urusvati Institute. The Institute buildings are currently occupied by the Himalayas Folk Art Museum, the room of the so-called "botanical archive" with remnants of botanical and zoological collections of the Institute, Helena Roerich Art College, the room with remnants of the scientific library “Urusvati”, the display exhibition devoted to the history of “Urusvati”, and a display on the activities of Yu.N. Roerich as the director of the Institute. 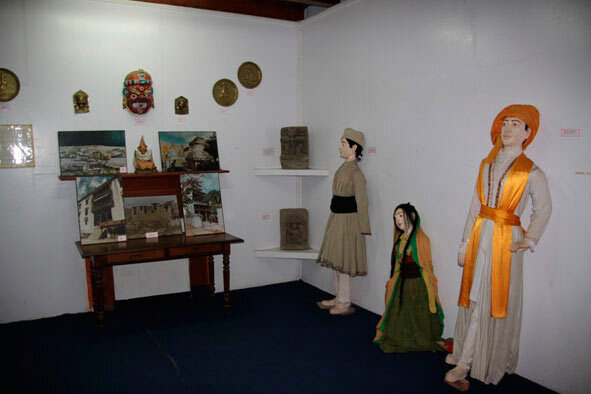 The exhibition of the Himalayas Folk Art Museum located in the former administration building of the Institute, has a random selection of displays. 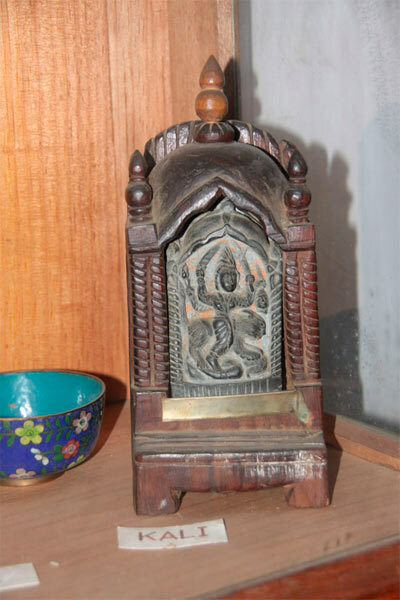 It includes a significant number of pieces of art of the western Himalayas, previously owned by the Roerichs without any indication of this ownership. Together with the preserved memorial exhibits from the Roerich collection there are modern photographs and mannequins in traditional costumes, questionable paintings by contemporary artists and other exhibits (in particular, a collection of Samara folk art) that have nothing to do with the Roerichs and their activities. 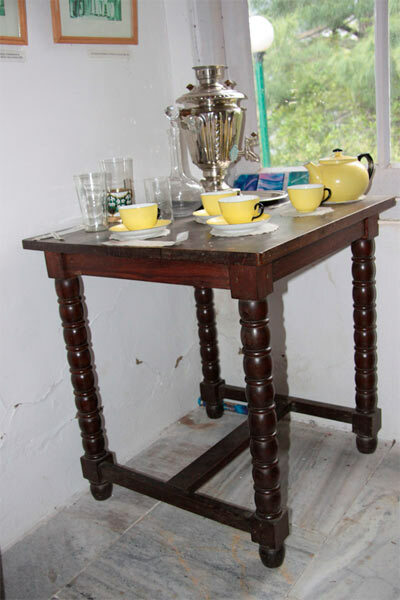 In a shopping kiosk located on the glass veranda of the second floor, memorial furniture of the Institute is being used. Some of the drawers of this furniture are lost. The former administration building used to house collections of the Institute in preserved form. The creation of this exhibition has completely disturbed the historic interiors of the building and led to the dispersal of the remainder of the scientific collections. There is almost no memorial furniture of the Institute on display. Most of it is lost. Remains of the memorial of furniture were discovered by us in one of the premises of the former laboratory building of the Institute. The second floor. 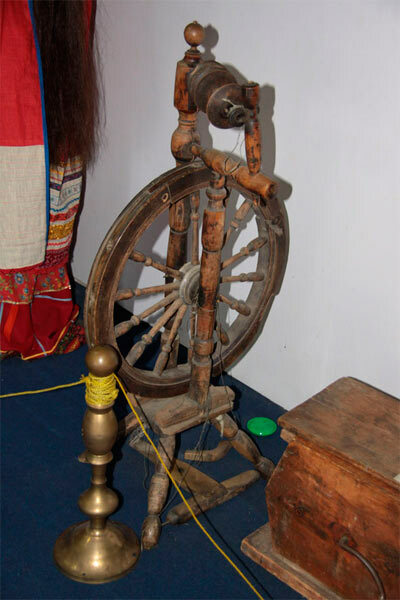 Architectural element from the Roerich collection Spinning wheel. 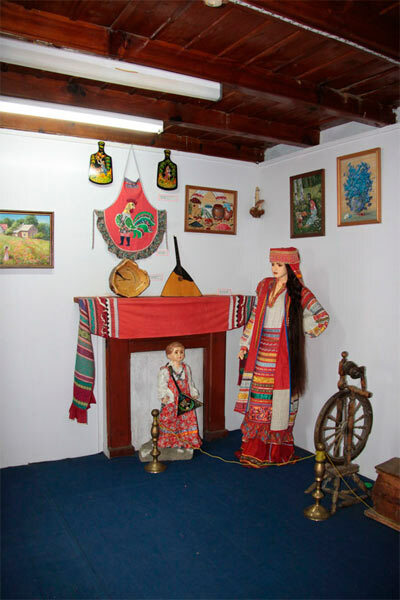 The exhibition with the collection of Samara folk art on the second floor . 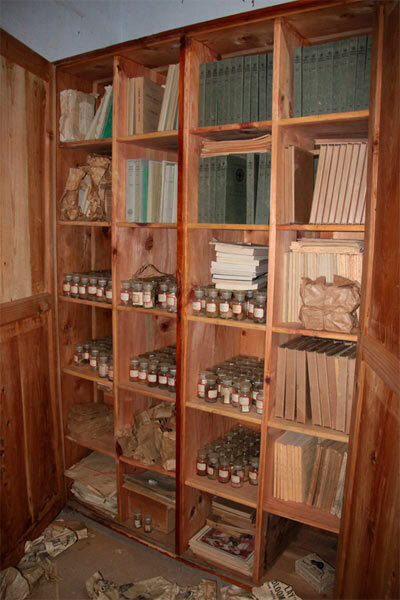 The premise of the so-called “Botanical Archive” at the time of our inspection was heavily littered and dusty. In the room, along with the remnants of botanical and zoological collections of the Institute, cabinets with memorial books from the Urusvati library, there are several hundreds of modern books published by M. Lunev. 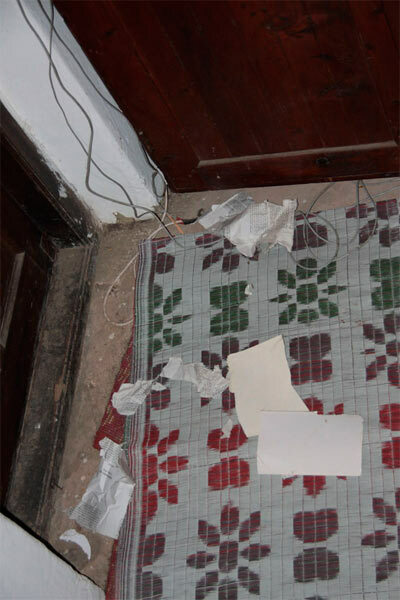 Fragments of laboratory equipment were scattered all over the room. 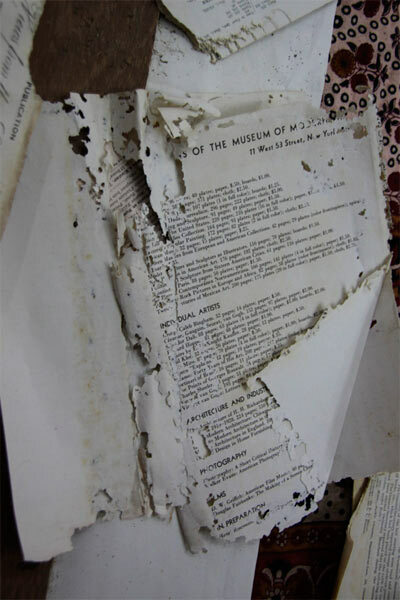 Most books we have examined are severely damaged by silverfish. The same applies to the discovered memorial maps. From the paleontology collection “Urusvati” there have survived only a human skull with fragments of a skeleton, which is in one of the boxes in the built-in closet. 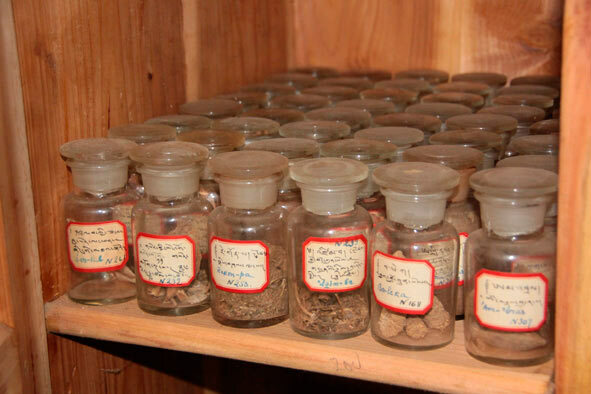 In the room, we have also found part of a collection of seeds of medicinal plants kept in glass jars. It should be noted that this premise is not suitable for storage, registration, restoration and research of collections. It is a very small area. There is no ventilation, special lighting, humidity and temperature controlling appliances, specialized museum storage equipment (metal cabinets, a table for inspection, etc.). Former Laboratory Building of Urusvati Institute. 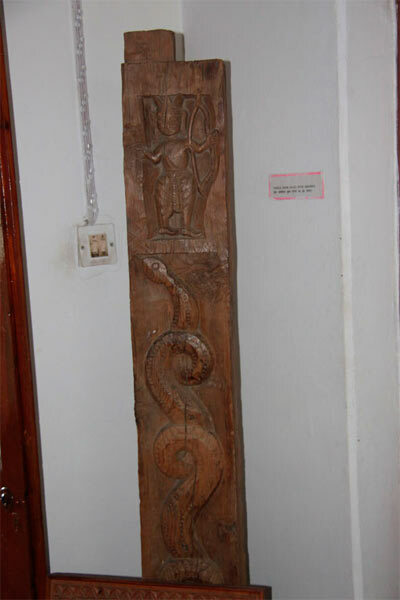 Safety of the Roerich heritage stored in the Laboratory building also raises serious concerns. Laboratory building of Urusvati Institute. 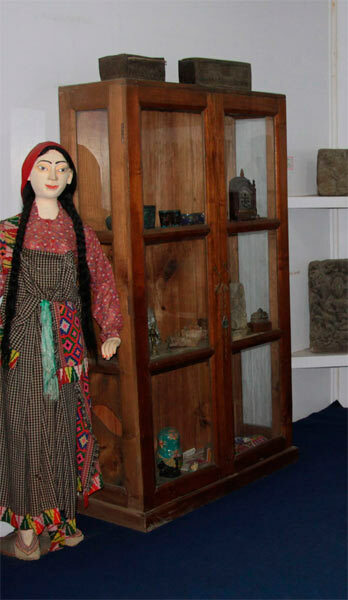 The exhibition devoted to the history of Urusvati Institute misses labels explaining the purpose of the exhibits. There is no annotation revealing the general idea of the exhibition. Many exhibits are damaged (especially the herbaria in the box) and in need of restoration. Some of the books are on open display, which is undesirable for reasons of safety and security. Display cases also need to be replaced. The exhibition devoted to scientific activity of Yu. N. Roerich. Much of the original exhibits presented in the exhibition devoted to scientific activity of Yu.N. Roerich needs restoration. This is true for weapons (sword), covered with rust, leather things (fragment of a horse harness and other fractured exhibits). A significant number of items displays are placed on a wooden ramp (saddles on cubic pedestals) that runs along the walls of the room or hung on nails in the walls. Minerals, crystals and a ritual basin are also on open display, without any protection. 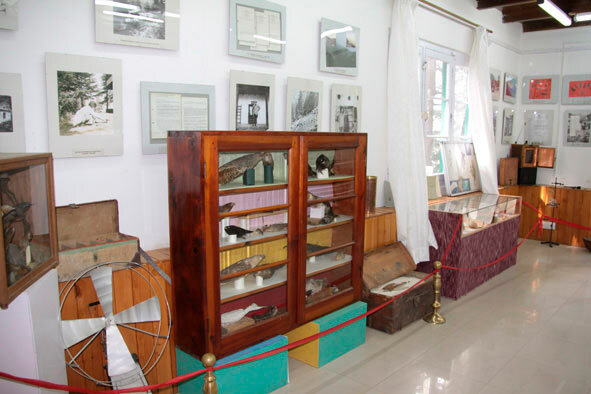 Such open storage of especially valuable memorial exhibits is allowed only in special museum arrangements with observance of light, temperature and humidity conditions and appropriate safety measures. There are no such conditions in this room, so it is necessary to make special glass display cases, which protect the exhibits from moisture, dust and other adverse effects. The exhibition includes original archival photographs, memorial maps, manuscripts of the Roerichs, which affects their preservation since the room is not fit for it. For example, the photographs are very deformed and the leather exhibits are extremely over-dried. 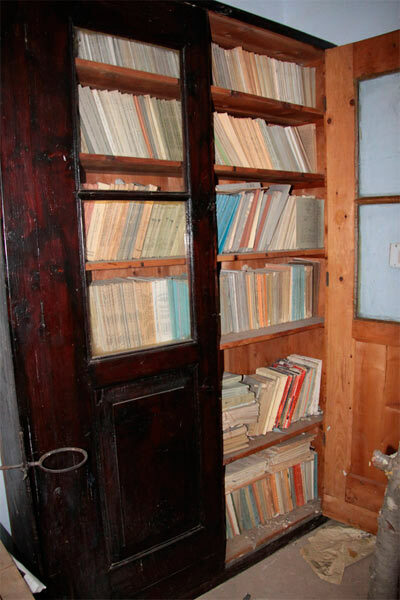 The Scientific Library of the Urusvati Institute located in a small room on the first floor of the laboratory building is also stored in improper conditions. During the initial inspection of the library, we have revealed a lot of dust, cobwebs, mildew and insects in the bookcases. 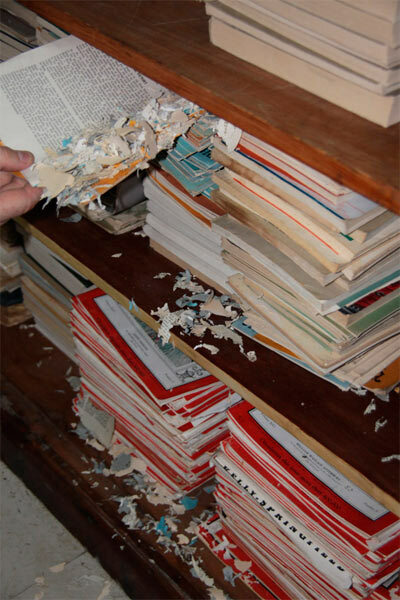 A significant number of books are damaged by silverfish. It mostly concerns books printed on thin paper. 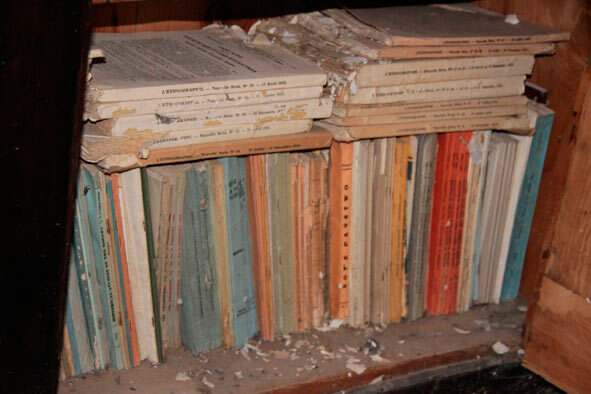 Some books are damaged by small rodents. The room itself has not been cleaned for a long time. 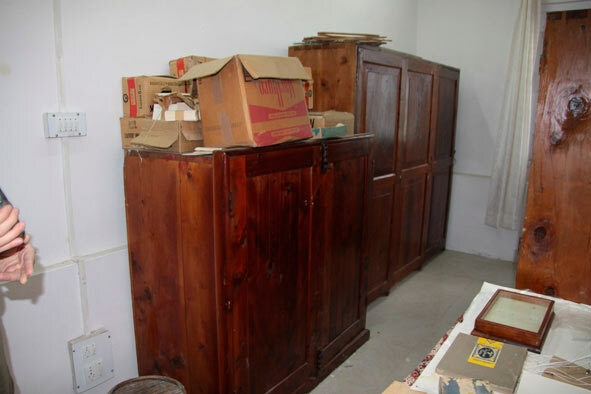 Memorial cabinets made of wood are infected by insects, mold, and very dusty. Most books are in need of immediate restoration and transfer to a specialized facility for books with the appropriate temperature and humidity conditions. While working in the library, we found an inventory list of the library made in the 2000s on behalf of A. Adamkova. It includes about 2,300 books, whereas, according to S.N. Roerich, the library back in the 1970s had more than 4,000 books. This raises the reasonable question of where almost 2,000 units of scientific publications of the Urusvati library have disappeared? Unfortunately, we have to state the sad fact: most of the scientific collections of the Urusvati Institute have been lost by 2011. Over the past twenty years, a number of important scientific collections, in particular, a large mineralogical collection gathered by the Roerichs in the Central Asia Expedition (CAE), much of the ethnographic and archaeological collections, and much more, have disappeared almost completely. The same applies to archive materials Urusvati, as well as the scientific library. A little upward from the main buildings of the Urusvati Institute is a small one-level building built presumably for economic needs of the institute. The building is very dilapidated and in emergency condition. Urgent measures are needed to save it. Another problem is the large accumulation of debris, both near this building and behind the main and laboratory buildings of the institute. The entire slope behind the buildings is strewn with debris. The problem of garbage disposal affects not only IRMT, but the entire valley since there is no centralized garbage removal. We need to make a separate stop at the issue of records, and the inventory list of the Roerich memorial heritage should serve as the basis. This documentation is the foundation of any museum institution. At the moment, nothing is known about the existence of the inventory list created by S.N. Roerich himself. Apparently, S.N. Roerich did not have time to make it. In 2005, the ICR management asked V.A. Adamkova if the Trust has a complete inventory list of IRMT property. The letter of A. Adamkova to ICR makes it clear that there had been two inventory lists, made by Russian Cultural Centre in New Delhi led by B. Starostin (1992?) and the Indian side by the order of Kamal Anand (1996). Yet neither the first nor the second inventory list could not be found. Work of the Russian Cultural Center resulted in the export of part of archive materials of Urusvati Institute to New Delhi. Subsequently, the rest of the Urusvati archive was removed from Kullu to New Delhi by the Russian Ambassador to India A.M. Kadakin. Documents from New Delhi arrived in the Archive of Foreign Policy of the Russian Federation in the RF Foreign Ministry. Through the efforts of L.V.Shaposhnikova, these archives have been transferred to the Department of Manuscripts of ICR. According to the testimony of L.V. Shaposhnikova, it is known that diaries of a participant of the Central Asia Expedition Dr. K.N. Ryabinina from the Urusvati archive are partially lost. That archive also did not have the manuscript of the expedition diary of P.K .Portnyagin. In one of his publications  V.A. Rosov unashamedly writes that the expedition diary of P.K. Portnyagin became the property of Samara Publishing House “Agni” (?!). Any documents of "the inventory list" conducted by the Russian Cultural Center are currently lacking. The second inventory was conducted on the initiative of Kamal Anand. For this purpose, Dr. Balbir Chohan, Director of Department of Archeological Survey of India in Shimla, was engaged. They painted account numbers on the museum exhibits and issued a small catalogue with grave inaccuracies and omissions. Unfortunately, the Indian party represented by the government of the state Himachal Pradesh, has never raise and is not raising the issue of building a modern museum building, as S.N. Roerich wanted, to organize a full-fledged art museum exhibition and to create a specialized museum storage facility. However, it should be noted that the full restoration of Roerichs’ house, including emergency measures in the nearest future, is possible only after the establishment of such a museum storage, where the Roerich heritage should be moved from the emergency-state house. It should be noted that the leadership of ICR has repeatedly offered to the Indian side assistance in organizing a full-fledged N.K. 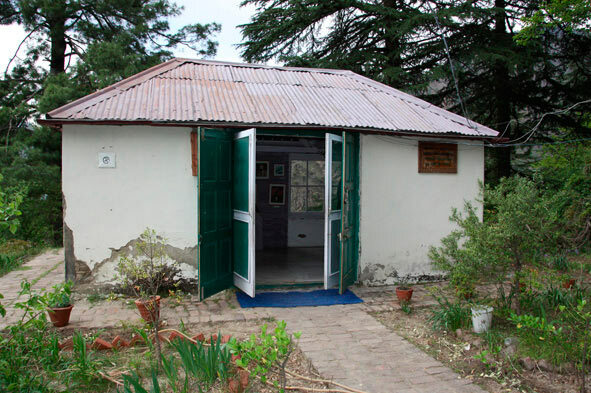 Roerich Museum in Kullu and the restoration of Urusvati Institute. So, in 2005 at a meeting of the Board of Trustees of IRMT a draft Protocol on Joint Intentions of ICR and IRMT was presented, which highlighted further development of the Museum-estate of the Roerichs in Kullu and the rebirth of Urusvati Institute. The project was approved in principle. The rebirth of Urusvati Institute was decided to conduct in two areas: memorial museum and research, which was to be implemented jointly by Indian and Russian scientists . However, contrary to the arrangements made, the Indian party in 2006 refused the participation of the Russian museum professionals from ICR in the joint work on museumificaton of the Roerich estate and making a comprehensive catalogue of the Roerich property located in IRMT. By now, local authorities of the state of Himachal Pradesh is almost entirely in control of IRMT, and limited participation of federal officials of India and representatives of the Russian party in it. Unilaterally, the local Indian officials lowered the status of the Russian representative - Executive Director-Supervisor A. Adamkova and have completely handed over control of the use of funds to the assigned administrator. Joint meetings of the Board of Trustees of IRMT with participation of the Russian party are no longer held. 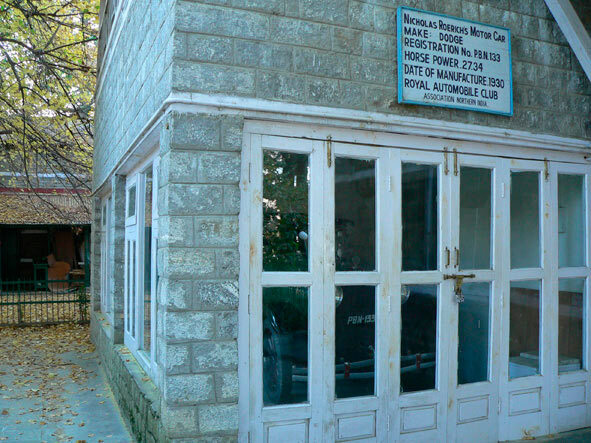 The emergency state of Roerichs’ house, lack of a modern museum building, necessary museum staff and a comprehensive list of the Roerich heritage in Kullu (including the scientific collections Urusvati) raise an acute question of the need to take measures for urgent conservation and museumificaton of this heritage for the future of Russia and India, and also the return to the concept of development of IRMT proposed by S.N. Roerich in 1992. 6 See in detail: D.Yu. Revyakin. The Dying Heritage: Moscow Apartment of Yu.N. Roerich. Moscow: ICR, Master-Bank, 2010.